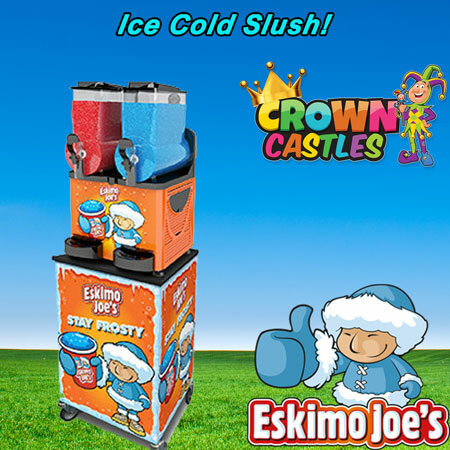 Cool your guests down with our beautiful, Italian made Eskimo Joe's Professional slush machine hire. Amazing offers for schools, colleges, Universities, charity & community events! We can supply for 2000 guests and if required, a member of staff can also be supplied, please contact us with full details of your event and we will provide you with a free quote. Comes with a stand and everything which you need! All you need to supply is the power and this frozen delight is ready to go. This slush machine hire is available in Cambridge, Bedford, Huntingdon, Northamptonshire, Peterborough and all towns between. Our Eskimo Joe's Slush Machine Hire will keep the kids (and the adults) cool this summer and give your party a unique feeling. The slush machine hire comes with preloaded with two flavours, strawberry and raspberry, they come straight from Eskimo Joe himself and are quite simply the best tasting slush puppies! Other Flavours can be ordered but 14 days notice is required. "It's the best slush I have ever tasted!" "Doesn't turn to ice & lose its flavour like other slush puppies"
Kids and adults go crazy for this slush; it is a quirky alternative add-on for any party! Slush Hire includes 20 litres of slush syrup ( 10L blue raspberry) 10L red Strawberry) which is enough to make approximately 60/65 medium cups. Flavours we hold in stock - raspberry and strawberry. We only ever hold in stock strawberry and raspberry, we can supply additional flavours, however, 14 days notice and a non-refundable deposit will apply. You can hire this slush machine on its own or alongside any of our bouncy castles. Cups, lids, and straws are all provided and will make approximately 60 cups, extra slush syrup can be supplied if needed and we may be able to provide additional flavours if enough notice is given (at least 14 days) please contact us for more details. Our Slush Machine Hire in Cambridge & Huntingdon has free delivery as does our Slush Machine Hire to St Neots, in fact, if you are local to us in Kimbolton there will be no delivery charge! This Amazing, Professional & Italian made slush machine is available across Cambridge, Bedfordshire & Northamptonshire. Book Online Today Or Give Us A Call!